Daniel O’Connell was such a substantial figure that a century after his passing, Martin Luther King and Mahatma Gandhi were influenced by him. Charles Stewart Parnell was another extraordinary parliamentarian, described by William Ewart Gladstone as "an intellectual phenomenon". In 1885, as leader of the Irish Parliamentary Party, Parnell held the balance of power between Gladstone’s Liberals and Salisbury’s Conservatives in a hung Westminster parliament. Sir Edward Carson shaped history on several fronts, including his campaign against Home Rule, his role as the first signatory of the Ulster Covenant and the part he played as First Lord of the Admiralty in forcing the resignation of Prime Minister Herbert Asquith in December 1916. In more recent times, for a wide range of reasons, Gerry Fitt, Bernadette Devlin, Rev Ian Paisley, John Hume and David Trimble all made a mark in Westminster. But there is a case to be made that nothing compares to the House of Commons drama currently unfolding before our eyes. Ten DUP representatives, ‘the Irish Question’ and Britain’s centuries-old misgivings about ‘things European’ are combining to produce combustion that has rattled the House of Commons to its foundations. The curious and awkward truth is it was not intended to be like this. What developed into a thunderstorm began life as a burp. The archive footage of Northern Ireland’s Brexit Referendum Centre at Belfast’s Titanic Quarter in the small hours of 24 June 2016 tells an interesting story. The UK had voted 52% leave and 48% remain in contrast to Northern Ireland’s 56% remain v 44% leave. Only two elected representatives, MPs Sammy Wilson and Edwin Poots, were in the handful of DUP members who stayed to acknowledge and cheer the fruits of their labours. When David Cameron, fresh from his unexpected overall majority 2015 general election success, confirmed his promise to hold a referendum on the UK’s EU membership, the DUP were involved in a power-sharing administration with Sinn Féin at Stormont. Devolved government in Northern Ireland was the DUP’s main area of activity, Arlene Foster, the party’s leader, was an Assembly member, not an MP. The DUPs eight Westminster MPs were peripheral figures in the 650-member House of Commons. Seven of the eight, Nigel Dodds, Sammy Wilson, Ian Paisley Jr, Jeffrey Donaldson, David Simpson, Jim Shannon, and Gregory Campbell, had all served as Assembly members in Stormont. (The eighth, Gavin Robinson, made the jump directly from Belfast City Council to Westminster). After holding a dual mandate was ruled out, for strategic, party or personal reasons, the seven opted to concentrate on business in the House of Commons and end their Stormont ties. The London life offered structured routines – regular scheduled flights from Belfast City Airport; some committee membership work at Westminster; occasional speaking opportunities in the House of Commons chamber, often at poorly-attended sessions on Northern Ireland issues; home on the flight for constituency clinics, party business and back over to London for more of the same the following week. In Westminster power politics, the DUP were limited players. Less than 2% of the House of Commons membership, good company in the coffee rooms and bars who often fraternised with Eurosceptics who had similar views on many subjects. How all that changed is a scarcely believable saga in the laws of unintended consequences. Channel 4’s impressive drama about Brexit, The Uncivil War, suggested that a former Michael Gove spin-doctor, Dominic Cummings, was the Svengali-like figure who masterminded the Leave campaign. He was portrayed as the controller of the chessboard on which the likes of Boris Johnson, Nigel Farage and other prominent Brexiteers were pawns. If Cummings was a little-known figure among the voting public, Lee Reynolds is another who certainly fits into that category. Such was the seriousness with which the DUP approached the Brexit referendum campaign that Lee Reynolds, once a member of the Ulster Unionist Party, an unsuccessful DUP candidate in Belfast City Council elections (later co-opted by the party when a vacancy arose), was given a key role in organising the party’s Brexit campaign strategy, while Foster and her key advisers got on with the challenging job of managing power-sharing at Stormont. One of the intriguing themes of ‘The Uncivil War’ production was that Cummings managed to commandeer a squad of geeks who understand the dark arts of algorithms, social media alleys and the keyboard habits of up to three million individuals with no tradition of voting. The theory is that Cummings managed to harness the support of this cohort of previously unwooables in the same way that Donald Trump tapped into a lucrative vein of cyberspace in the US presidential election. One DUP initiative in the closing phase of the Brexit campaign probably did not have such new, secret science behind it. (BBC Northern Ireland’s Spotlight made a stab at telling this story several weeks ago). In the final days of the campaign, with the blessing of at least some of the party’s MPs, funds were sent from Scotland to Northern Ireland and then brought back over again to finance last-minute persuasive literature that was given out to commuters the length and breadth of Britain, but was never distributed in Northern Ireland. This was one dramatic example of the DUP recognising and exploiting Northern Ireland’s difference from the rest of the United Kingdom to fund an intervention in the Brexit campaign. Theresa May is the alchemist who transported the DUP from the fringes of Westminster politics to the very centre of power and influence. She is the person who unwittingly provided the DUP with the capacity to undermine and possibly end her political career. The 2015 General Election gave the Conservative party 331 of the 650 Westminster seats. After David Cameron stood aside following the Brexit referendum result in June 2016, May replaced him. Reflections during a hill-walking Easter break in 2017 persuaded her to call a general election on 8 June. Opinion polls suggested the Tories might end up with 395 seats. The voters gave them 318 – eight short of the number required to form a government. Mrs May didn’t just give the DUP unprecedented influence. She unwittingly brought the Irish Question onto the floor of Westminster and she guaranteed that only one version of the Northern Ireland story would be represented. DUP numbers increased from eight to ten in the 2017 general election. The SDLP was wiped out with its three seats going to Sinn Féin, whose now seven members committed to continuing an abstentionist policy. 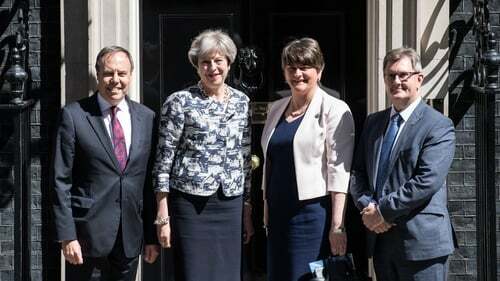 The British prime minister got a brutal indication of the DUP’s capacity to exercise its power in December 2017. Perturbed by accounts of the deal Mrs May was pursuing with the EU leaders in Brussels, Foster phoned her prime minister and insisted that she alter her position. The pattern of DUP muscle-exercising would continue as the Brexit complexities deepened. A common theme in the endless discussions about the Irish backstop in London, Dublin and the very centre of the EU, Brussels, is the need to protect The Good Friday Agreement and the peace process. It is true that the agreement reached at Castle Buildings, Belfast in April 1998 had a European dimension and influence. It allows citizens of Northern Ireland to hold British or Irish (EU) citizenship, or both. It led to Ireland (by referendum) changing elements of its Constitution, including its territorial claim on Northern Ireland. It enhanced the possibilities of the EU funding projects in Northern Ireland and border counties in the Republic that would enhance reconciliation and north-south cooperation. But some of the most fundamental changes, put in jeopardy by Brexit, came before the 1998 Good Friday Agreement and the IRA’s ceasefire of August 1994. A recent search of RTÉ’s archives produced a fascinating report of soon to retire colleague, Brendan Wright, transmitted in the final days of December 1992. It documented how border posts and the systems of customs checks were about to disappear forever – all as a result of the Single European Act. The SEA was the first major revision of the 1957 Treaty of Rome. It was signed in Luxembourg in February 1986 and later that month at a second summit in The Hague. Its objective was to establish a European Single Market by 31 December 1992. Ireland held a Referendum on the Single European Act on 26 May 1987 – on a turnout of 44%, and by a 70-30 margin, the electorate favoured joining the Single Market. On the island of Ireland it took from 1987 to the final seconds of 1992, almost six years, to put in place the arrangements that saw the disappearance of customs posts along the border. A decade would pass before the peace process facilitated the dismantling of British Army watch-towers and border security installations. But the tangible evidence of day-to-day business normality, a consequence of EU membership, significantly predates the Good Friday Agreement. A case could be made that those visible, practical changes, including the ending of queues and inspections at the border, was a driver of what became the peace process. On D for Disaster Day of Theresa May, 15 January 2019, Foster chose to start her morning as a speaker at a conference of Brexiteers in London. Her availability to be in London, not Belfast on such a historic day points to an important truth. For two years, in her role as an elected member of the Northern Ireland Assembly, she has been without a day job. The DUP has been unable to successfully carry out two conflicting functions – power brokers in Westminster and power sharers in Stormont. Sinn Féin struggled, failed and in 2004 finally abandoned its efforts to pursue its version of such Dissociative Identity Disorder. David Trimble and Seamus Mallon consistently argued that it was impossible for republicans to continue with a policy of an armalite in one hand and a ballot box in the other. It was Ian Paisley and Peter Robinson who eventually insisted the practice of paramilitaries by night and politicians by day would have to end as the price for entering power-sharing. The switch in the DUP focus from Stormont to Westminster is all but total. And not even the party’s critics could question its effectiveness. Sammy Wilson is a frequent guest on the BBC network. MPs publicly stating how they carefully look across the House of Commons chamber to monitor the body language of Nigel Dodds. Jeremy Corbyn, the life-long leftie, doing political contortions in the forlorn hope that he might attract the backing of Arlene Foster. The DUP’s insistence that the ‘border backstop must go’ gaining the support of not just Brexiteers, but some middle-ground Tories and sections of the Labour party. But now comes the hard part. There is no viable Plan B. The general election that Jeremy Corbyn craves won’t happen because he has no hope of mustering the required two-thirds of House of Commons members to prematurely end a fixed-term parliament. The DUP, with form in the art of saying No, have brought their blocking expertise to the House of Commons and used it. But the only alternative they offer is the EU member states will come to their senses and offer a solution that will be accepted by the DUP. In the stalemate, Northern Ireland remains closed for political business while at the centre of the Brexit row. With no Westminster MPs, the SDLP no longer had meaningful work for two of its most competent staff or the money to pay them so they are working for the Scottish National Party in Westminster. Sinn Féin has a cadre of part-time Assembly members, out of practice in the art of politics and compromise. Máirtín Ó Muilleoir for example – remember him? Once a Stormont finance minister, promising to building thousands of local authority houses. One of the few Irish-speaking Sinn Féin Assembly members who was a driver in the Irish Language campaign that put pressure on the DUP. When did he last feature prominently? The DUP’s Assembly team is in the same freeze-frame mode. To the majority of her constituents who voted to remain in the Brexit referendum, Arlene Foster is Arlene Antoinette. She is out of sync with the majority of her constituents in the Fermanagh/Tyrone constituency. Farming organisations and business groups are publicly taking issue with the DUP’s Brexit stance. With the return of power-sharing an impossible ask while the Brexit saga unfolds, Foster’s next significant date on the Northern Ireland political stage may be the publication of the public inquiry findings into the Renewable Heat Incentive Scheme. And that is likely to be more Theresa May than Cinderella. Significant elements of the potential of the DUP’s first female leader, a politician from a border constituency, are as yet unfulfilled. The situation of the party’s deputy leader, Nigel Dodds, is another imperfect equation. The DUP’s dogged insistence on leaving the European Union means his wife, Diane, is in the final stages of her career as a member of the European Parliament. She may find a new role in Westminster or the House of Lords. But if ever there was a DUP member suited to the European stage, she is that person. In spring, when the emblem of kamikaze pilots, the cherry blossom is in bloom, she will be saying her farewells in Strasbourg and Brussels. Gregory Campbell, the East Londonderry MP, is one of the Westminster Ten. As with Nigel and Diane Dodds, he has very personal reasons for despising republican paramilitaries. He often found it hard to forget a failed attempt to plant explosives under a vehicle used by his loved ones. Yet in February last year, when there was sparse support from the Westminster Ten for Foster’s efforts to strike a deal on restoring power-sharing, Gregory Campbell solidly supported her failed attempt. It was a striking example of a politician who was prepared to set aside bitter experience in favour of what he judges to be the greater good. Even in their most successful phase at Westminster, the DUP is paying a price. Last week, Tánaiste and Minister for Foreign Affairs Simon Coveney visited Belfast. He shares the Peter Robinson view that if power-sharing could be got up and running at Stormont, if North-South and Dublin-London relations could be improved, then ground-up positivity might change the political climate and help the search for a solution to the Brexit challenge. The Tánaiste wears his heart on his sleeve. If that’s the case, Leo Varadkar wears a waistcoat. Hard to figure out. But if this week signals the high-point of DUP influence in British politics and from now on the journey will become more complex, the unavoidable truth is Ireland, north and south, is in the stew. The stories we like to believe about our resourcefulness are about to be tested like never before.